Because last time my Bullet Journal Setup was late, my February Setup is even earlier. I spent my whole weekend to draw the next 4 weeks and I’m quite happy with my results. This time my Bullet Journal setup for February is all featured with flowers. I really wanted to use my Tombow Number 772 as a highlight colour and with my watercolour I created matching pictures for that. After I loved using my January Setup, I wanted something to stick with that and so I started to think about what I liked about this setup and which parts made some difficulties. For examples I had so many to do lists everywhere which should be all part of y Bullet Journal instead – at least this is my opinion. An example for what I did not like is my cover page, because I did not watch it as often as I wished for. It is really pretty and so it is kind of a waste to have it on a page I do not open as much. Because of this I decided to have my February cover page and my monthly overview on one spread side by side. Most of the times the picture for the cover page takes the most effort and so I will see it every time I go back to my monthly log. For the monthly overview I did the same segmentation as I did in January and December. Currently this is the most efficient layout for me. I can write down multiple appointments on one date or long-term projects. And you know: never change a winning team! So as long as it works for me, I will stick to this. The weekdays have 2cm each and the weekend 1.5cm each, because I don’t have that much to do on the weekends. I am surprised that I managed to fill in my tracker for the last 28 days and it really motivated me to do something to get this little circle at the end of the day. That’s why I did the spread as I did it in January again. 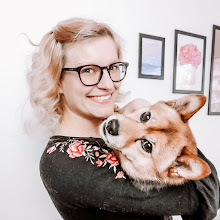 I chose the habits workout, early Pam (doing a workout from Pamela Reif in the morning), 2x Simba (walk the dog twice), healthy food, Clue (use the app) and Instagram. To make this spread I used my stamps, BUT each stamp has 31 days, which made it difficult to get just 28 on the page. In the end it worked best with having an extra sheet of paper underneath the stamp. So the days 29 – 31 are on another paper and just the first 28 are in my Leuchtturm1917. But to be honest it was tricky, and it took me several attempts till I was brave enough to do the real spread. And as you can see even then it did not work 100% - as my last month just has 27 days. 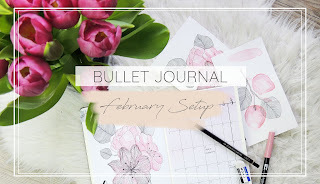 If you have seen my Bullet Journal Setup for January, you will now realize: it worked! Because February looks nearly the same. I think the Dutch door is really cool and that’s why I cut down one page to 8cm. One little difference to last month is the part to do’s this week. It is just for things I want to do but I cannot schedule a day or I need more than one day to do it, so I leave it there to write it down when I know when I will do it. When I divide my pages I always try to have almost the same space for each day, which is not possible every time, but this time it worked well. By the time I realized that I don’t need that much horizontal space and I rather have more length than width. The flowers on the side have bee originally made on watercolour paper (as almost every painting this month) and then I scanned and printed it. Unfortunately, I underestimated the size and now I must write on it, but that’s okay. It will be part of the “background” instead of a highlight on the side. For my second Dutch door I made it a bit bigger. It is 11cm width and is perfect to mage a horizontal weekly spread. For this I wrote down my appointments in the first row and all my to-do’s underneath. To have all columns one size I made the weekend in one column with 3,5cm each. The little branch in the upper left corner resp. on the next page is again a watercolour painting I scanned and printed in different sizes. For me it is so much easier to do it this way, because I can paint it bigger with all the details but at the end it fits (almost) perfect in my Bullet Journal. And this is my Bullet Journal setup for February! I’m satisfied with the design and I hope I will be able to work with it as productive as it was in January. I’m not 100% sure for how long I will continue with the tracker, but so far I’m motivated to keep doing. I hope you like my Bullet Journal setup and you got some inspiration. I would appreciate it if you would tell me your thoughts in the comments below!